My name is Joe Ganje but you can call me Billy. Who is “My Mechanic Maintenance & Repair”? My dad taught me the love and passion that goes into working on vehicles, and “the pride that comes along with it”. I was about 15 when he put me to work and I have been working on cars ever since. At the end of the day what matters most to me is that your car is back on the road and you are happy with the work that was completed. So if you are in the market for someone to take care of routine maintenance, occasional repair, aftermarket equipment installation, or are looking for a complete rebuild, let My Mechanic Maintenance & Repair be Your Mechanic. The service provided to me by Franklin and Boxx was exceptional! I felt welcomed and everyone was so kind and patient. I would highly recommend My Mechanic for services any time. Repair was performed correctly, on time, at competitive price–routine for My Mechanic. Great service , nice people!! Deana took me where I needed to go while my car was being fixed . All in all a great experience. Thank You Guys !!! My family has been using My Mechanic for over 2 years now. We are a 4 car, 4 driver family…My Mechanic has taken care of our tires, belts, alignments, used vehicle inspections, brakes, batteries, hoses..you name it. Free shuttle service and no charge for the smiles! Billy, Dena and the whole My Mechanic crew treat us like family. My Mechanic is the best!! I have been treated like family. When it was apparent that my repairs exceeded my budget, they worked with me to prioritize the repairs. I am now nearly through the entire list of repairs. When my daughter’s vehicle “died” they had it fully repaired and operational the day after it was towed to their facility. I highly recommend My Mechanic!!! This shop NEVER fails!! They are thorough, they are prompt, they are trustworthy, they are professional and respectful. My whole family uses them and I tell all my friends and co-workers about them. Replaced broken vacuum hose at no charge. Quick in, quick out, good price. My go to service center. I have nothing but great things to say about My Mechanic Maintenance & Repair! They repaired the stereo amp problem for less than they estimated it would cost. They also did a free inspection of the mechanics for possible issues to be aware of in thee future. But, the thing that impressed me the most was their friendly, courteous and trustworthy service. The staff at My Mechanic are very accommodating. Always friendly and smiling. They explain everything that was done and what needs to be addressed in a way you can understand. By far the best shop in town!! The quality of service that I receive from My Mechanic is superb! They always deliver top notch service at a reasonable price. I will not take my car anywhere else!! By far the best mechanic shop my husband and I have found. The mechanics and the owners are all hardworking honest individuals and it is evident they truly care for their customers. The complimentary shuttle service has been super helpful as well and we cannot say enough great things about this shop. So if you’re looking for mechanic work, look no farther. Guaranteed you will love them! The folks at My Mechanic Maintenance & Repair went the extra mile for me in the repair of my vehicle. I would highly recommend them. Fantastic service. Clutch went out day before Thanksgiving. Towed to the shop on a recommendation and will be a return customer when needed. Franklin walked me through step by step. Prices are fair and considering they had to order parts the service was cpleted in a timely manner. Did the rear main seal at the same time to save on future labor costs. Has been leaking for years. Clutch is smooth as it should be. Would no hesitate to recommend. Another great time at My mechanic. Had my oil changed on my new van, excellent service and staff, I take both my Van’s here to be serviced and I can’t say enough good things about this mechanic shop they go above and beyond to get your car working right again. I also like to recommend them to people I know and people I meet looking for a great mechanic. Oh my Gosh! My faith has been renewed in mechanics! This shop is the opposite of what I have dealt with my whole life. Honest and trustworthy. I am so grateful to have a place to bring our families cars and know I will be told what MUST be done and what can wait. Its the what can wait I never heard before. Thank you, Thank you, Thank you! Its reassuring having My Mechanic as my mechanic. Excellent customer service, Friendly people . Been very pleased with diagnosis and results. obvious customer service a top priority. was recommended to me . definitely would recommend ! I had my car at another garage and they couldn’t diagnose the problem. They sent it to My Mechanic and not only did they diagnose the problem but they were honest about the cost, financing and they were prompt in completing the work. I will gladly use them again if I need to. My Mechanic provides me with complete peace of mind when it comes to the maintenance of our family vehicles. My Mechanic is fabulous. I have had the wonderful opportunity to meet Billy, Deana, Boxx and now Franklin. Every aspect of their business is superbly managed and they provide the absolute best service to their customers. I know this is fact because they provide it for my family all the time! We brought our Traverse in for a pre-trip checkup, which is free! I knew we were getting close to needing tires, they verified it for us. Billy provided us a great option for tires and provided our vehicle with a clean bill of health. Dean even provided me with transportation to my office and picked me up when the vehicle was ready. My wife is ecstatic with how it rides! We drove it today to Anaheim for our family Thanksgiving Disneyland trip. Everything was superb. Thank you so much for all you do to take care of my family! While traveling from California to Tucson on a Sunday evening I ended up breaking down at a gas station in a rough part of Tucson. A guy at the gas pump (Daniel) next to me heard me trying to get my turbo diesel F250 back up & running. He told me he had a friend (Billy) who owned “The Best” mechanic shop ANYWHERE (turned out he was so right). He said that it was “my mechanic” which at first I thought was a backyard mechanic & wanted nothing to do with his suggestion. He then called his friend Billy at home & while they were having dinner Billy made the time to speak with me. He was so kind, accommodating & reassuring to assist a long distance traveler who was broke down in a strange place not knowing a soul there. I immediately felt comfortable with Billy’s knowledge of diesel’s & cars in general as I have been in the automotive business for most of my life. I called AAA (which also confirmed that the shop was top of their list of referrals) & had the truck towed to his shop on N. Romero Rd. Early the next morning Billy, Dena & the whole crew at My Mechanic Maintenance & Repair jumped right into diagnosing what had happened to my rig. Here I was literally trapped not knowing if it was going to be something catastrophic & yet every member of there shop were not only very professional they were super positive & assured me that they would have it figured out & have me back on the road as quickly as possible (which is EXACTLY what they did). While hanging out there awaiting parts for days I witnessed and spoke to many clients who were new (like me) & long time dedicated ones who sincerely were so SOLD on the top notch quality/professionalism that they always receive from Billy & Dena at a very, very fair price I might add! You see I am a vintage European sports car exporter so I buy & tow vehicles all over the country so inevitably I break down from time to time. AND I can truly say I have never experienced any repair shop quite like My Mechanic Arizona & only wish I could clone them & have them closer to my shop in Northern California. So since that is not possible I plan on coordinately future repairs that I need when I am traveling anywhere near to Tucson. As not only do I now have my newest/greatest & incredibly honest mechanic there, I also have friends now in Tucson that I look forward to visiting with. THANK YOU all so very much for treating me like we were long time best friends as I know for certain that we will be dear friends for years to come. As you truly rescued me from what could have turned out to be the opposite of the awesome experience I received. Your new friend AND now dedicated client Michael in Northern California. I’m so grateful and impressed with My Mechanic. Billy, Dena and the entire crew are honest and dependable. They work very hard to help the customer and when they say they’ll do something, they do it. I won’t slam my previous service provider here, but I’ll just say I wish I’d found My Mechanic sooner. Billy and the staff at My Mechanic have been great, they’re communicative, willing to explain anything in more detail, and extremely nice. I found my first experience with them so promising, I brought another car in shortly after and had my mother go to them when she had trouble with her car. My Mechanic is the best auto repair shop I have ever been to! They were able to fix our truck when other local mechanics failed to do so. They are very honest, helpful and professional. We highly recommend this garage. General maintenance at this appointment. I have been using My Mechanic for about two years now. Their service is top notch and their prices are very reasonable. No surprises on big jobs and no selling what’s not needed. I’m a very satisfied customer. General maintenance at this appointment. I have been using My Mechanic for about two years now. Their service is top notch and their prices are very reasonable. No surprises on big jobs and no selling what’s not needed. I’m a very satisfied customer. Whenever I bring my truck to Billy and his team, they always diagnose the problem quickly and accurately. I know I can trust them to get it right the first time. I have no intentions of going anywhere else for vehicle repairs. My car developed a problem with the fuel pump not working right on a hot afternoon. Billy and his crew had a difficult time chasing down the issue and had even tested all the components in the fuel system trying to eliminate the inexpensive items first. Eventually they got the fuel pump to give them the same trouble it would give me some times, and realized it was cavatating and pumping bubbles into the fuel system. Billy and his crew spent a lot of extra time and effort to find the exact issue and charged me for only the repair, and nothing for all the test drives and extra time testing all the components of the fuel system. I want everyone to know how much i appreciate Billy and his staff and their hard work. So my wife was stranded on the freeway on the 2nd of July. She searched on her phone for the best car repair shop closest to her vicinity with a 3.5 rating or above. MY MECHANIC came up with a 5 star rating !! Their Family went beyond my wifes highest expectations of a auto repair shop. They even had a tech drive her to our second car and install a battery while the shop assessed the first car. She received such great customer service that we as a family will be recommending MY MECHANIC to all our friends and neighbors, and especially all our single female friends. Best service in Tucson. Billy and his employees will not take advantage of you and will not try to sell you something you don’t need. This is a fair and HONEST mechanic shop. This place is AWESOME! Billy & Dina and the other guys are GREAT. They are up front & honest with you. Been taking my car(s) here for awhile. Another great experience with My Mechanic! I had trouble with the idle and Billy and team discovered a vacuum leak was the cause. After fixing that and completing a requested fuel injection service Billy recommended a few changes that I followed up on. Providing timely advice is one of several characteristics I like best about this business; and their thoughtful recommendations and advice are always with your best interest at heart. It demonstrates they truly care. These characteristics build trust, confidence and brand loyalty. Thanks again!! Take my car in and got it tuned up Got it back on time Very good very good place to take your vehicle to get it work done Trash for Lee Courteous And everything was done on time with the shuttle service Thank you very much my mechanic The family ran place for family business Very respectfully very honest An overall just a good place to take your vehicle to get it work done In the shadow services as good as it gets that’s on time And very courteous. Robert King. My Mechanic is by far the best place to take your vehicle for any repair or service. Billy is honest and very reasonable on his prices. I have taken my car to him before and I have always been happy with the service, prices, and the customer service. Billy, his wife Dena, and crew are all wonderful people. I would recommend My Mechanic to anyone. Thank you! My mechanic maintenance and repair is awesome! Very, very knowledgeable with all makes and models of vehicles. They service both my vehicles and do a outstanding job. They can figure problems out that other repair shops can’t. When I first started going to my mechanic maintenance and repair it was when I had two well known corporate repair shops tell me that my engine was bad, then I found out about my mechanic maintenance and repair from my mom and they found out it was the flex plate in between my engine and transmission which only was a little over 350 fix instead of a whole new engine. so, happy I took it there, so now ever since then my vehicles have only been serviced there, also to top it off all the staff there are so awesome and friendly. Wonderful shop!!!! This is the third time I’ve taken my car to My Mechanic. All work has been done correctly when promised. Billy is friendly and knowlegeable. He matched and beat Brake max quote. Billy his wife and his mechanics work like a well oiled machine. His wife shuttles you where you need to go with professionalism and courteousy. My Mechanic has gained another customer for life. Randomly found this place after a desire to never go back to my old mechanic again. From the first phone call to when I picked my car up again everyone was very helpful and answered whatever questions I had. Didn’t feel pressured to buy anything more then what I originally brought my car in for which I appreciate. Billy and Dena are great and immediately make you feel welcome. Definitely bringing my car back here. Billy (Owner) was not only helpful but took the extra steps to make sure my son’s Camry was in great shape to meet the Emissions requirements. He & his wife Dena’s friendly service & professionalism shine through in whether it’s answering the phone, explaining the work necessary to fix a car, or in their shuttle car service. All was greatly appreciated & will definitely return & refer My Mechanic to others!! Fellow females needing auto repair but nervous you’re going to be sold parts and services you don’t need?? Rest assured, I have found our haven!! Let me start by saying that I’m a highly skeptical person by nature – with a strong background in sales. Even though Billy at My Mechanic came highly recommended by three people, I remained guarded. But the skepticism was quickly put to rest as soon as I met Billy and Dena. They are warm, professional, and most importantly they are genuine. I had a fantastic experience at this establishment. I highly recommend them to anyone needing auto repair/maintenance. Billy is thorough and will put everything in a written quote for you. The final price when I picked up my vehicle was actually lower than the quoted estimate, as I didn’t end up needing a part that another repair shop told me I did. Exceptional , honest, affordable, superb service is what you get at My Mechanic. Great staff, fast service, fair prices. I would recommend My Mechanic to anyone needing service on their vehicles. Billy, Dena, and Russ will take care of you! This big Ford diesel would not start but the staff at My Mechanic got this beast running again. They fixed the stationing issue, a steering column issue and replaced the radiator overflow tank. I have used My Mechanic on 4 of the 8 vehicles I own. Different manufacturers, different model years and different configurations (gas, diesel, hybrid) and I always get incredible service at a fair cost. The staff at My Mechanic are friendly, helpful and most importantly experts in their field. They provide great options and work with you to get you and your vehicle back on the road. Excellent Professional Service, Treated with High Respect,Highly Recommended, Very Knowledgeable, I Have Told Several People. From The moment I entered the shop I was welcomed by Billy and his staff and they made me feel right at home. Billy explained to me about what the initial inspection of my vehicle would be as this was my first time getting car service here. The service was excellent and the price was appropriate . I have been looking for a permanent mechanic and today I found mine. give Billy and his staff a 5 Star rating Thank you all. Excellent in all regards! As a newly arrived snowbird to Tucson, my “check engine” light came on. My son who lives in Tucson recommended My Mechanic. I called and they were very nice on the phone. They quoted my a price of $100 to diagnose the problem and the final bill would depend on what type of fixes were needed. It turned out to be the O2 sensor and the total bill was $247.00 which seemed fair and reasonable given my prior experiences at other places in the past. The car was ready on time. And, they have shuttle available if needed! We can always count on two things when visiting My Mechanic: Fabulous customer service and honest, thorough workmanship. We drive a wheelchair ramp equipped van and count on it to function. Billy, and Richard always get us up and going ASAP! Once again, Billy and his wife Dena were there for me again. My alternator went out and not only did they pick me up where I was stranded, they also provided me a rental car for the day so I could continue seeing my patients. They actually paid for my rental car until my car was fixed. Which happened to be the very next day!! This mechanics here are awesome and went above and beyond when i needed there assistance the most! highly recommend them they will take care of the issue for a really god price right on time. We had a broken mirror on the driver side mirror. The dealership said we had to replace the whole side mirror unit for around $800. My Mechanic was able to just replace the mirror for a cost of $45. We greatly appreciate there honesty and will be back for future work and repairs. Just moving to Tucson, i needed a reliable and honest mechanic. I needed a headlight bulb replacement. 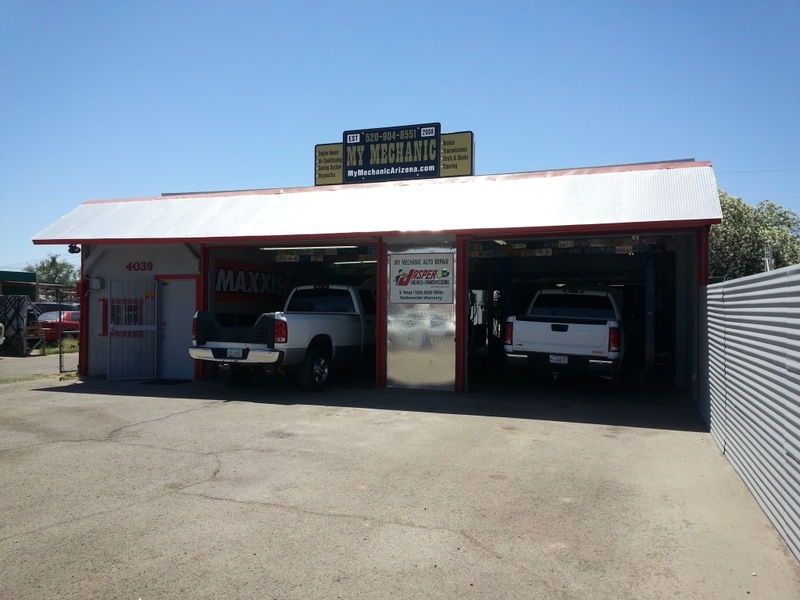 I would highly recommend “My Mechanic” , 4039 N. Romero Rd, Tucson. Even though they were closed today, they told me I could come in to the shop right away and they would take care of my car headlight. They explained everything to me upfront and the repair was done, very quickly. Very honest and knowledgeable, Very, Very reasonable. I now have a mechanic in Tucson. I will be back, I AM TOTALLY-SOLD ON “MY MECHANIC”. I was Very impressed with their Professionalism, 100% Customer Service, High Integrity and Pricing for repairs! I would rate this mechanic shop a full 10 stars all the way across the board! You WONT be DISAPPOINTED, HIGHLY RECOMMEND! This was my second appointment with My Mechanic and they did not let me down. The scheduled work was for front schock absorbers and an oil change. Pick up was to be NLT than 12:00. About 10:00, Billy called to say the fuel filter should be changed (along with the job cost) and that the transmission and differential were coming due for a service. Not now, but soon. Our family brings all of our vehicles to My Mechanic. They are reliable, honest and fair priced. All around nice staff. My Pathfinder is now a very reliable vehicle, even though it is a 99, and this is due to having it worked on at My Mechanic. I know they will take care of any issue the first time I take it there and cost is very reasonable, they also have always listened to me when I speak to them about my vehicle. I highly recommend this establishment to anyone!!! I have been going to MY mechanic for a year and a half. I always felt the mechanics were honest and easy to work with. The atmosphere is very friendly and open. I trust them 100% and will continue to take my vehicles there for repairs and service. We, my wife and I, have great respect for Billy and the team. We have not experienced any unnecessary things that they did when repairing our truck. They were very confident that their work is 100% the best they can do. Integrity is the word for the work and workers at My Mechanic, Tucson. We, my wife and I, have great respect for Billy and the team. We have not experienced any unnecessary things that they did when repairing our truck. They were very confident that their work is 100% the best they can do. Integrity is the word for the work and workers at My Mechanic, Tucson. Billy is the most honest and trustworthy mechanic I have ever experienced. He has always gone above and beyond to help me out. Even though I live almost an hour away now, I still take my car to him! I have been using My Mechanic for years. They are a very friendly shop and they treat you like a member of the family. They have very reasonable rates for their services and are extremely dependable. I tell everyone I know about them and now take all my cars here for servicing. Whether it is an emergency or scheduled visit their staff is always quick and friendly. I trust their opinion of what needs to be done on my car and they stand by their work. Billy is an awesome mechanic. His work is thorough and efficient. I also found his shop to be competitively priced. You won’t go wrong choosing My Mechanic to do your repairs. I have been going to My Mechanic for a few years now. Billy and his crew have always been professional and knowledgeable about my vehicle. They have been able to take care of my truck as if it was their own. Reasonable in price and has my vehicle done when promised. I highly recommend My Mechanic to anyone that has trouble or just service with their vehicle. Thank you My Mechanic! Love this auto shop! Everyone in the office is friendly and kind. They give me all my options even if it doesn’t benefit them. I trust them with my vehicle and know I am getting the best care! Billy and co are great. Good service at a fair price. They guarantee their work so if something isn’t quit right, they will make sure to make it right with no hassles. I highly recommend! Billy is great with my car, even though it’s a jalopy, he makes sure I can drve my car. Very efficient, honest with car problems. I know I can always trust Billy. My mechanic had a family atmosphere when I walked in. I appreciated the ride back to work as well as the honest feeling I got when speaking with Billie the owner. Will be going back and calling my mechanic my own. So this is the 3rd time we take one of our vehicles to My Mechanic because they are always up front and guarantee their work. I have had great experiences with their work as well as their staff who are always willing to help and are friendly. Thank you to all for your hard work and sacrifice. The people at My Mechanic always take such good care of my car. They have serviced the transmission and the cooling system. They also have done oil changes and helped me out with numerous little things. They are amazing. I have had more than one visit with Billy and company. They have been very pleasant, easy to work with, and treat their customers with respect. I recommend my mechanic and the staff who works with him. Billy and Dena are the most wonderful people to do business with. I was able to make an appointment to drop off my car and Dena dropped me of at work and then came to pick me up at the end of my day! Hassle free, spectacular service! Thank you for always being the best! Billy and Dena are the most wonderful people to do business with. I was able to make an appointment to drop off my car and Dena dropped me of at work and then came to pick me up at the end of my day! Hassle free, spectacular service! Thank you for always being the best! The staff was very friendly and professional. The mechanics were very knowledgeable. I was very happy with the service done on my vehicle. This is a number one shop. I would not take my car anywhere else! They give the best service anywhere in town. The owners are on hand, Billy runs the front and Dena does the shuttle. You can’t ask for better customer service. I have been taking my car to Billy for a few years now. He has always taken good care of me and my car. He is always honest about what is the issue and his pricing is very fair. I have never left his shop thinking I could have gotten the repair cheaper elsewhere. His staff is friendly and always helpful as well. They also guarantee their work. I have never had an issue with the shop and have nothing but Great things to say. Whether it’s the convenient shuttle they offer or the courtesy diagnostic check they gave before we went to the emissions center, My Mechanic always goes the extra mile to make sure their customers are happy. They are very friendly and nice people who seem to actually care about their customers. I would recommend them to anyone that needs work done on their car. I “heart” My Mechanic! They fit me in, same-day, for an oil change on a busy Friday. They are always friendly and prompt. I think of them first, whenever my car needs service. You guys are the best! I had a great experience. They whole team was helpful, professional and friendly. They completed my repairs on time and gave me a ride to my office in their free shuttle so I could get my work done while they worked on my car. A real thumbs up experience! My second time at My Mechanic. They explained everything in terms I could understand. Quality work, trustworthy, good pricing, friendly staff. Will always take my car here. I highly recommend them. My brakes started crying around 4:30 on a Thursday afternoon. So, I called My Mechanic to see about setting up an appointment. They asked if I’d like to pop on in. I said that I would be there in 15 minutes. Mind you, they close at 5. Most places would have said to come in the next day – not these guys! They inspected my car and it turned out that I needed new rear brakes. Instead of them expecting me to take their word for it, they sent me a full diagnostic report with pictures! I was able to make an appointment for the next morning and was done by lunch. Their customer service was absolutely amazing and my car can stop on a dime now. I highly recommend My Mechanic to anyone looking for a great, honest and dependable mechanic. Thanks guys!! I have taken my car to My Mechanic twice in the last 6 weeks – for separate repairs. Both times the team was responsive, helpful and patient. They also accept extended warranties. Shawn was particularly helpful every step of the way. I will definitely be using them again for repairs. patient. They also accept extended warranties. Shawn was particularly helpful every step of the way. I will definitely be using them again for repairs. I took my car this morning for repairs to the bumper. I did not have an appointment, but they took me right in. They repaired the bumper an checked the car over. I needed an oil change, they did that and changed all the filters. They were very friendly and nice like an old hometown operation. Dena offered to take me home or anywhere I needed to go, but I was happy to stay and drink the very good coffee. They kept me informed as to time line and costs. I was very happy with that. I haven’t lived in Tucson very long, but I think I have found ” My Mechanic”, and I would recommend them to anyone. I’m sure I will be going back. Complete inspection and identified issues and assisted in making recommendations. Their work is always excellent and they kept me informed regarding timelines. I enjoy working with Sean, Billy and Dena. i took my car in to have some work done on my car that I was certain it needed. After inspecting the car, they determined that the car did not need that work. There was no charge for that inspection. This shop has the most honest, professional, and accommodating staff I have ever dealt with. If you want reliable, honest and professional auto shop, this is the place to go. Billy (the OWNER of the shop) diagnosed the problem with my car. He asked me if it’s still in warranty, I replied I don’t think so. I made some calls and found out that it WAS still in warranty. He asked the warranty guy some questions, gave me a heads up of what to expect from the dealership, and mentioned that if they try to charge me for the repair, to call him and he would do what he could to make sure there was no out-of-pocket for me for going to the dealership…and off I went to the dealership. This is representative of the integrity and goodwill that My Mechanic has at all times, with all customers. Thank you so much for saving me $200! I like My Mechanic because they get me in and out, quick. No surprises. Also, Billy and Dena are awesome…and Netflix in their lobby, also awesome. First time visit with my Ram 3500 6.7l Cummins, and it was a great experience! Everyone was very nice and service was fast. Recommendations were made without pressure. Just found MY MECHANIC for my truck! Excellent work for fair price!!! I highly recommend anyone to go here!! I am constantly driving around for work and do a pretty good job of getting routine maintenance. I started feeling like I didn’t have control over my car on bumpy roads though and would hear a weird noise when I backed my car out of the garage. I called My Mechanic and said something didn’t seem right. As usual, they were very friendly and urged me to bring the car in. It turns out my rear shocks were very worn and needed replacing, which explained why bumpy roads became so difficult to drive on. Dena was awesome and took me to my first work appointment the following day when I brought the car in. Really glad to have found a mechanic that cares about its customers and their safety, not just turning a profit. They will have my business for years to come. The My Mechanic team was able to get me in for a much needed oil change, transmission fluid change, and air filter change…even with my crazy work schedule. I feel much more confident taking the truck out for our road trip. I wouldn’t take my vehicles to anyone else. I have 4 older vehicles. I depend on Billy, Dena Shawn and the rest of the crew to keep my family safe and on the road. My Mechanic is honest and friendly and dependable. Trust your family’s fleet to the professionals at My Mechanic! This is the best auto repair shop in Tucson, AZ. Attention to detail, knowledgable, reasonably priced, excellent customer service, treat you fairly every time!! No baloney here. This shop has some of the best mechanics in Tucson and will do their best to fix your problems economically and efficiently. I normally will not allow another person to work on my car besides myself, but this shop is the exception. Great service and jobs well done. The employee’s where very friendly, and professional. The garage is well kept up, and reminds me of Jimmy’s Broadway Automotive, that has since closed down, I’m glad there is a shop in town that still has that old school feel. I have had 3 vehicles repaired at this shop. Nothing changes…customer service and quality of work is always top notch! Gotta share with all y’all: Today I took the Kia in for routine 45k miles maintenance. Took it to My Mechanic on North Romero here in The Naked Pueblo. I was amazed! They changed the oil, air filter and cabin filter, pulled a big ol’ screw out of the right front tire, repaired the damage and did just about every inspection the manufacturer called for. I was anticipating a very large bill but was truly amazed it was less than $130! High quality work, from people in whom my trust grows every time I do business with’m. Words fail this cowboy when trying to express how much I love the crew at My Mechanic. TGhey’re hitting it out of the park! Best experience I have had regarding Auto repair service. The staff are all great and honest, especially when providing detailed information. They take the time to physically go over all items upon initial inspection and again when work has been completed. This is now “My Repair Shop” and thanks to my neighbor for the referral! I had a leak somewhere in my power steering system. I’d been topping off the reservoir once a week or so for a few months. I was pretty anxious, because the last thing that I needed was to spend a bunch of money just before Christmas on a new power steering system (my worst fear) I was going to do some driving over the holidays, so I decided to bite the bullet and take my 4runner in to My Mechanic. I puckered up as I waited to get the bad news from Shawn about the huge balance that I was going to have to cough up. As I was bracing for bad news. Shawn told me that I needed a new hose clamp….. That was it. No power steering system, not even a new hose. Just a new hose clamp. This is why I recommend My Mechanic. Another shop may have taken advantage of me and installed a new PS system. I trust My Mechanic and everybody on their staff. Try them and you will too. I am an outside sales rep. who uses my own car to call on customers for a towing company. I was visiting shops in the area when my car started running terrible, i remembered how nice the people were at my mechanic when i called on them last month and decided to ask them to help me with my car, even though i didn’t have an appointment. They told me to go ahead and come right over and they would fit me in, billy quickly and accurately found the answer to the issue that had been making the car run bad for the last 8 months. He worked through his lunch hour to repair my car so i could go right back to work and not loose any time, he even repaired some leaking vacuum fittings that were adding to the cars problem. Now my car runs perfect again and it didn’t cost me a fortune to get it repaired. I bring all of my vehicles to My Mechanic for repair and Maintenance. This trip was for an oil change. They discovered my air filter was full of debris and brought that to my attention, so they changed that also. I always get the feeling that they really care that the vehicle is repaired correctly and they always show me the part they are replacing. These guys are the best. My Mechanic Maintenance & Repairs is a fantastic shop. Everyone there is friendly, honest and no- nonsense. You will never be oversold and you can count on Billie and Dena and the entire staff to be 100% straight with you. Our family has 4 high mileage vehicles and we depend on Mechanic Maintenance & Repairs to keep us all on the road. Give My Mechanic Maintenance & Repairs a test run by scheduling your next oil change with them. I’ll bet you will come to count on them for quality professional auto service, just like me and my family do. Quick and easy repair. They are very trustworthy and honest, which I appreciate. We also had our 09 Jeep Wrangler repaired. My husband and I really appreciated their honesty and professionalism. The entire staff were very friendly. We would highly recommend this auto repair shop. Yep, I blew up my wrangler, but Shawn, Billy and the Wrangler whisperer Tommy got it all back together. It was great, timely service for a reasonable price. I can’t say I enjoy going to a garage for repairs, but if I have to do it, this is where I’ll be. Yep, I blew up my wrangler, but Shawn, Billy and the Wrangler whisperer Tommy got it all back together. It was great, timely service for a reasonable price. I can’t say I enjoy going to a garage for repairs, but if I have to do it, this is where I’ll be. I have never experienced such great customer service. To be honest the last place I was expecting to be overall a great experience is a mechanic but this place is outstanding. I’m a college student so I have absolutely no idea what I’m doing and everyone here is so great. They show me everything that needs to be fixed and are very accomadating. Also the owner and his wife GREAT genuine people, also Shawn. Didn’t get the name of everyone else but would defiantly recommend and will be a future regular customer for sure. We have several vehicles that we take to My Mechanic, but on this day we took our daughters Toyota Corolla in. We we were told by several people the repairs would be very costly. Since we trust My Mechanic we were prepared to pay what was necessary. Their quote came in at 1/2 the price of what others said and her car feels like a new car. We are always treated with great care by the staff and we are thankful to have a mechanic that is trustworthy and honest. Will continue to do business with them for years to come. The staff are always friendly and honest! I can count on them to Fox my car, and Fox it the right way! This shop is Amazing! It is hard to find a good repair shop but this one has it all. They are reasonable in price, honest and friendly. I am so happy and will be taking all my cars there even if it’s just for an oil change. I highly recommend them. This was our first experience here. And we LOVED it. Shawn explained everything. Even as far as what was needed and not needed. Richard did a GREAT job on the van. Looking forward to doing more business with this awesome company. Excellent customer service. They get you in and out in a hurry and fix it right the first time. I appreciate the hometown small business appeal and I am very happy with the honesty, integrity, and pricing of My Mechanic Maintenance & Repair!! My car (turbo engine) was having an issue with lagging at take off, and it for some reason completely died on me while turning a corner one afternoon, for no apparent reason. I took it into Shawn the next day, assuming I would need a fuel filter or something in the fuel system area. Shawn did a diagnostic test, and could not find any codes or anything as to why it died on me. He could not get it to happen again. Instead of just changing the fuel filter, or fuel pump like the majority of shops would have done to make money, he did his homework and researched what possible causes it could be, what issues have been found on the make and model of my car. He called and told me what he found, and told me to watch for a couple things if it happened again. He did say he recommended adding BG44K to help the system and did recommend a cabin air filter. I approved the recommended work and picked up my car that afternoon. It no longer lags!! I can push the accelerator and go without worrying if I have a city block of space between me and any oncoming traffic! My A/C no longer smells musty, and I was VERY happy when I got my bill. I do, and have, recommended My Mechanic to family and friends. They are the only people I trust with my kids’ cars as well! We went in thinking that we would have an expensive electrical problem with our car. Instead after checking the car, they found that one issue was the cause of another problem. They fixed it the same day. All problems solved! We have been here multiple times with 2 vehicles and have always had a positive experience. My Mechanic shop is reasonable as well as trustworthy. A friend recommended them to us and now we recommend them to other friends. This shop does a great job. All the people are super to deal with. Thank you. I highly recommend this garage. The staff is very professional, informative and take great care of their customers and their vehicles. I love love love this mechanic , and it always has amazing customer service. My car was wonderful after visiting them, 10/10 for sure. Great customer service! Fast, fair, and friendly! I would highly recommend My Mechanic. My evening could’ve been ruined if it weren’t for My Mechanic. When my car stalled in the middle of a u-turn and I was able to speak with Billy only moments later (after getting parked safely), it was a huge relief to me. He asked a few questions so that he might be able to formulate an idea of what the problem was, we arranged a way to get my car towed, and he assured me that they would take a look at it first thing the next morning. They replaced the sensor that had failed, charged me a reasonable price and had me back on the road within 24 hours. I “heart” My Mechanic! This is the second A/C repair that I had done at My Mechanic. The repairs were excellent, and they gave me a ride back to my home while they were working on my car and came and got me when the work was done. And I live 30 minutes across town from the garage! They also helped me find a way to pay less for the second repair on my A/C that I needed. This is a great repair shop, and I will have them do all my regular maintenance from now on also. The folks over at My Mechanic are always on top of their work. They do great work and I don’t think I have ever had a better experience at a shop before. I had the seals for my transmission replaced, which was not cheap even for a car like mine, but, it would have costed much more anywhere else. I get total value for my money. The best part is I had several places to be that day, and they drove me from each to the other. I have never seen a shop put that much effort into making a customer feel appreciated. Great Job Guys and Lady! Bought a driver door lock actuator assembly from a dealer, and tried installing it, but ran into problems. Called My Mechanic, and they agreed to finish installing it. After installation, the lock still didn’t work, so the door lock actuator assembly was removed, and it was discovered that the cable on the assembly was too long. The dealer had sold me the wrong one. My Mechanic came to the rescue, however, by removing the longer cable and installing the original cable, which now works fine. The actuator cables are usually not what fails, it’s the electrical actuators themselves, so I was satisfied with that fix. My Mechanic as usual provided excellent customer service and got the job done correctly, but I did learn a lesson to let the professionals at My Mechanic obtain the correct parts in the future, and to stay away from installations that only a professional should attempt to do, in the first place. Dena, Billy and Shawn, as usual, are incredibly friendly people who show much appreciation for my business and treat me like a member of their family, rather than just another customer number, as the dealerships do. Thanks, to all of you! Trustworthy and affordable! I waited to post a review until after I had a few repairs and maintenance services done. They have been the best place in Tucson, for single women like myself, to trust and still be affordable! Besides being excellent at the repairs, they blew me away with the service! They even take me to and pick me up from work! They found and fixed things I forgot to mention to them and then, didn’t charge for the extra labor! After many years of feeling like I was being ripped off by the national chain places, My Mechanic has restored my faith in getting excellent repairs and service, at an affordable price! I hope all the single ladies try them. You will be amazed! I really appreciate My Mechanic for what they do for me and my family. We have 4 cars and I trust My Mechanic to make sure they are safe and road ready. Prices are very reasonable and I appreciate the shuttle service. I highly recommend My Mechanic! Dena and Billy are the rock stars of auto repair. The whole staff is great, friendly and knowledgeable. Have had 2 vehicles in for maintenance. They saved me money, time and mind. Will continue to have them be My Mechanic! I needed a control switch for the turn single/hazards/wipers/ & high beams, & Billy put that switch in. SUPER JOB!! I have been To My Mechanic a lot of times for my oil change and they have always been great! Shawn has great customer service skills and Dena is always so great to check up with me and see how things are going! I tell all my friends and family about my mechanic. Thank you everyone who works on my car and helps keep this a great business to come back to. I cant to see you all soon on my next appointment. Dena got me to and from my job promptly. Shawn called me to check on something before proceeding…I let him know what my budget was and he and Billy made it work. The entire crew at the shop made me feel comfortable and confident with having my car taken care of at My Mechanic! They offer the best service around. I would trust them with any kind of repairs. Very knowledgeable and courteous! I think Billy new what was wrong with it before I could finish telling him the ‘symptoms’! I took the Jeep in there and they had it done in no time! Runs great! Dena came and picked me up at work, took me to my Jeep…..paid a very reasonable price! Thank you so much! Recommend them HIGHLY! These guys are great! They explain what they will do, how they will do it, and get it right. I will be taking my car there from now on. Their rates are reasonable, and have excellent customer service. Thank you. If you need vehicle work done, Billy and Sean are the people to see. They do excellent work at a reasonable price. They take the time to diagnose the vehicle issue(s) properly so you’re not paying for unneeded repairs. I recommend them highly. You guys are awesome! Always excellent service, respectful communication and I super appreciate that you completed a large job in a short amount of time. My Mini Winnie (Toyota cab, Winnebago back) is not only my transportation but also my home, and you always respect that and get the job done quickly! I feel safe and secure after you work on my car. I was very impressed that Deena was willing to come pick me up in the pouring rain when the work was done! I will highly recommend you to my friends! Thank you! My car had a check engine light on. I trouble-shot the car through multiple forums and narrowed it down to a camshaft actuator. (My Mechanic would charge me a little over $1,000 to replace the part). Upon arriving at the shop I requested they change the part. Shawn suggested I let them diagnose it to make sure that it was the issue so that way they could be held accountable if the actuator did not fix the issue. They diagnosed the car and found the wires to the camshaft actuator where broken. They could have very well said the actuator was bad, repaired the wire and charged me the $1,000. I would have never known since the check engine light would have been gone. Their honesty (saved me over $800) and communication over the entire process has been wonderful, they will be seeing my cars if anything else may arise. Great service, excellent mechanics ,reasonable prices ,,friendly people, best repair shop in Tucson. Always great service and very friendly staff. As a woman I never felt out of place when I come there with my car problem I truly appreciate that. I would recommend this shop to everyone. My Mechanic is great they fix my diesel on a regular basis and always provide the best quality of work and customer service. I’ve never had any issues with any of the work they’ve done for me and my family! Great shop to deal with and I always recommend them to friends and family. The people at my mechanic are fantastic! They are all very friendly. Everything is always done right, and they won’t charge you an arm and a leg! As a Canadian visiting Tucson for my first time, I had the good fortune of finding this excellent car repair/service shop run by Billy and his excellent team. All I needed was an oil change but I had already purchased my oil and a filter so just needed the labor. I phoned several of the larger shops but they really didn’t seem to want my business as there was virtually no discount for me having all the materials. Billy gave me a very fair quote and when I arrived at the shop half an hour later, I was taken in quickly. I was encouraged to watch and ensure everything was done well (and it was and I’m pretty fussy, doing all my own service work at home). They even rotated my tires and weren’t going to charge me. Based on what I saw today, I thoroughly recommend this shop for all levels of work; the staff are happy and thorough and Billy just seems to be a really professional and honest guy who treats your car like it was his own. Their customer service is great. Their Knowledge is excellent. Their service is prompt. and, their approach to auto repairs is professional, encompassing and trustworthy…!!! Had to bring the Mini in again. This time it was just a tune-up, but as always Billy got me out the door quickly even though they had to drive to the other side of Tucson to pick up the parts. Thank you guys! We bought our PT used and it had not been maintained very well, so we took it to My Mechanic and had to have several major things done. We were very pleased with the timely manner that the work was done and also the quality of work that was done. We were always informed if it was going to take longer to get work done weather it was supplier delays, their work load being heavy, or their running into problems on other vehicles that were ahead of us. We were really pleased to know approximately what our repairs would be. They also let us know what we might have to look at for future repairs/ maintenance so we could plan for services that will be needed in future.. Can’t ask for more than that. Along with the friendly people who serve the customers. Always a pleasure to go there. “MY MECHANIC” will always be our mechanic! Great service as always! Excellent customer service, and they are always liking it for your financial interests. If you are going to need to replace a part in the next few months, they will let you know and then they just keep an eye on it for you and let you know once it actually needs to be done. I’ve been going to My Mechanic for almost two years now, and I refuse to go anywhere else! After going to a competitor and paying too much for work I didn’t really need, I found My Mechanic. Shawn and Billy listened to what I said, asked good questions, and treated me with respect. They let me know what needed to be done, did the job right, and got it done on time. I could have saved myself hundreds of dollars if I had gone there first. I will definately be going back. Honest folks who really go the extra mile, here. Billy and Deena and team stand behind their work to make sure your vehicle is ‘right’. I’d recommend them! We have taken 3 of our Trucks to My Mechanic. Great service every time! After the found the problem they called us to go over what needed to be done and gave us the estimate. Work is always done on time and every one we have dealt with is always been very helpful and friendly! We drove I. From Ohio and experience CED mechanical problems with me car. We had the car towed to Billy’s shop. We could not be happier with the customer service. Billy,Shawn, and Deena went our of their way to make sure our car was fixed properly and we were completely satisfied. If you live in the Tucson area, this needs to be your shop of choice.Thank you folks, job well done. My Mechanic saved me 30% off the cost of a dealer estimated repair, and still used a genuine GM part, a door lock actuator. It took them just over an hour, while I waited. They have no fancy waiting room that serves food, no elaborate showroom floors with all the latest vehicles for sale, or huge overhead. Instead, they offer plain old honest, excellent service, done quickly and correctly, the first time. I appreciate that, because (saving) money talks and you-know-what walks. Speaking of walking, I walked away with $100 that they saved me. You can’t beat that! They quickly found the problem and fixed it. Also preformed some standard needed maintenance I had requested. Both done for a fair price and quickly. My Mechanic shop is the best auto shop in Tucson. Billy, Shawn and Deena go out of their way to give their customers top notch service, they’re are honest and reliable. As a single working woman I was looking for someone that would provide good work without trying to rip me off and add extra fees & services I didn’t need. I’ve been bringing my car here for two years now, I have no trouble making an appointment, but Billy will look at it the same day if there’s an emergency. Recently I needed to leave my car overnight unexpectedly, and Billy offered to hire a rental car for me so I could get to work. Deena took me to the rental agency and took care of all the paperwork, no extra cost for me. My car was put back together in one day, I dropped the rental off with My Mechanic and was back on the road! He even fixed the visor clip that had broken off and was lying in the console, I hadn’t even asked about it. It’s their attention to details like that, coupled with their service, friendliness and reasonable rates, that keeps me coming back! Thanks to everyone at My Mechanic!! I recently had my brakes replaced by My Mechanic and even tho the service was good, my car started to make the same grinding noise about a month later. So I called the shop and spoke with Shawn, the manager. After explaining to him the problem, he said to come in and they would take a look. The next morning, I drove in and Billy, the owner was there and as soon as I finished explaining things to him, we both hopped in my car-he dropped me off at my house and within an hour I had brand new brake pads of Billy’s choice and my car was done in about an hour! Billy drove back to my house to pick me up and I took him back to the shop. HE DIDNT CHARGE ME A DIME!! He didn’t even accept a bottled water as a thank you and he was absolutely the most polite and kindest mechanic I have ever met. I feel totally content with all my car issues and I know I can trust him without a single doubt. Family owned and LOCAL shop in which we all should be supporting instead of the Big Box Shops where your paying for the CEO to sail in Hawaii as he drives a brand new leased Lexus every 2 years. Billy! You are awesome and my friends/family will all be coming to you. Thank you for your extremely fabulous service with not a bit of drama. But most importantly-thank you for explaining & giving me a clear description of the problem and allowing me to finally find someone I can trust! For as long as I am driving, I will always come to you for my vehicles!! The best in the West without one single doubt! I promise you will not be disappointed with any service from My Mechanic!!!! Shawn was super nice and very helpful. I needed some repairs done on my wife’s car in a very urgent time frame. He was able to take the car in around noon and still manage to have it done the same day. The price was far less than I expected as well. I had to bring the car back a couple of days later for an unrelated problem. They were able to diagnose and fix the problem the same day again and didn’t even charge for the fix this time. I will absolutely be back again! Very pleased with the service! They are now ‘My Mechanic’ and I highly recommend them!! My car and I were treated with first class service. Billy and his wife made me feel like I was family and took care of my car needs. The pricing was wonderful. In fact after going to 2 other mechanics and having them tell me an outrageous estimate and telling me that I needed to replace a part in my car. Billy was able to get down to where the real issue was and save me money. The knowledge of my car and the way they treated me I will definitely be going back for other maitenance needs. Billie did a great job servicing my Jetta TDI. They are very straight forward, honest and know what the are doing. Very good at answering questions I had about my car. I trust these guys after one visit and will take all my work to them when in the Tucson area. Wonderful job! They were able to get my ‘check engine light’ off when no one else could. Very quick and cheap. I will be going back! This will be my mechanic from this day forward!!! I was so happy with the people and the service…keep up the great work guys! I had taken my truck to 3 other shops to get quotes. As a female, that is not that familiar with clutches, it was hard for me to know who to trust. I did my homework though, and when I took it to “Billy” and left it, I was amazed at the cost savings. And he did an excellent job, in a short period of time. I left it with him for the weekend. Picked it up on Monday. I would send anyone I know here for quotes and mechanic work!! Billy has always been so awesome when we take my car and husbands car to him. Very honest, and will make sure that everything is right. The best thing is here him say that he guarantees his work. Will always comes back. Fair priced, excellent service, and got what I needed done by someone I can trust. Thats why I go to My Mechanic. Fair, Honest,reliable and timely! This about sums up Billy and My Mechanic. I took my car to Billy by word of mouth. I was told about him and his services and was told that this is the place to go. I called Billy and explained my situation. Within minutes of talking to him on the phone I knew this was the guy for me. He even arranged a tow truck to take my car to him and the charge was added to the bill. Within a few hours we spoke again and he told it like it was. It was a serious repair and I knew it wasn’t going to be easy on the pocket but Billy got the job done and had me back on the road in no time. I was fully satisfied with the quality of work and the cost, which came in almost to the dollar of his estimate. He even reworked things that had been done incorrectly at another ‘shop’ here in town. Now my mother is customer as well. I will recommend Billy to any one that i know needs a fantastic mechanic! I was in a bad situation. My check engine light had been on for a year already and I hadn’t renewed my emissions tag in six months. If I didn’t pass emissions then I would have to buy a one time waiver for 300, because I had court that Monday where I was to show proof of emissions, registration, insurance, etc or I was going to lose the car! Billy helped me tremendously. He got the light to go off, made by car run better and didn’t charge me what he could have. I am very grateful for Billy’s services. He doesn’t have to be nice and honest; he just is. Billy is very honest and reliable.I would recommend him to family& friends. I’ve known Billy since he started his own shop and I can attest to this mans honesty. He looks out for the elderly and his business is growing because he cares about his clients vehicles. I take all my vehicles to him for maintenance and any work they need. I highly recommend him. We’ve been going to Billy since before he had his own shop. We wouldn’t go to anyone else. He’s always honest and doesn’t do anything that’s not needed. DON’T GO ANY WHERE ELS!!!! Knowledgable, conscientious, and fair. What more can you say. Billy has been my mechanic for years. He has worked on numerous vehicles for me in that time, always honest and fair. It is so important to have trust in a job well done… he does good work. I have been going to Billy for my Camry’s car upkeep and repairs for years. I will NEVER take my car to anyone else. He is honest and fair and his rates are the best in Tucson. I HIGHLY recommend Billy … he is the BEST! I am new to the area and actually work as an aircraft mechanic(prefer to not turn wrenches in my spare time), so my coworkers mostly do their own work and didn’t really have any advice on shops . So when my vehicle needed fixin’, I brought it to MyMechanic based on reviews. I was extremely impressed with the whole experience. Usually taking my vehicle in to the shop is something that I do with great reluctance. With MyMechanic I was thoroughly briefed on the issues of my vehicle as well as a few optional recommendations. MyMechanic even fixed a few things no extra charge! The only drawback for me is that the shop is across town. Slightly inconvenient, true, but having a place that does honest quality work is priceless. This is a nice shop to do business with. I had an oil change and had Billy check belts, tires, etc. since I had to do some out of town driving. I was referred by another happy customer. I brought my 2000 Malibu in to check what problems were wrong with it. He was very helpful and low priced. I highly suggest this mechanic. I just moved from Ohio and checked the web for a good mechanic. This site had the best reviews so I took my vehicle in for badly needed service. Billy gave me a quote of $202.00, but after checking the car out he found that the problem not as serious. He called me to let me know and said it was ready and the bill was adjusted to $89.00. Hard to find honest people in this trade. He has got my business from now on. I went to Billy at My Mechanic for my check engine light after reading really good reviews about him online. He more than met my expectations.He is a great, trustworthy and honest mechanic, and he will try to do whatever he can to help you. I would easily recommend him to everyone. Go to billy. Got to billy. Go to billy! Don’t ever go anywhere else! My uncle introduced me to billy and I haven’t gone anywhere else since! He is very honest, fair priced and is willing to go the extra mile to help you with your car. I had all 4 cylinders misfiring and a mystery code that just wont go away. Billy figured out what was making my car misfire and is continuing to help me get to the bottom of my mystery code. He has spent so much time on my car to make sure that he has ruled out every possibility!! Not only that but any time I had a question he would answer it in terms I could understand. I am referring everyone I know to him!! Got a problem with your car? GO TO BILLY! I too was referred to Billy by a friend and do not want anyone else working on my car. Billy is an honest, reliable mechanic that knows his stuff. It is hard to find a mechanic that truly cares about your safety and not your wallet! Billy has reasonable prices and will get your vehicle out and about as soon as possible. I had taken my car to another mechanic for years only to find that he was way high priced and did not do me justice on the repairs. I have been extremely pleased with Billy’s service, kindness, honesty, work ethics and so on. Thank you Billy for all you do for me and your other customers. Many Blessings with Love and Light to you and Dana and the new shop you are moving into. Have a great New Year ahead. Don’t go to another shop. Billy will treat you right. He is honest, beyond fair in pricing. Oh and an unbelievable mechanic. When other shops can’t fix it or ruin it Billy will get it done right. Billy is so nice and honest! My check engine light was on, he took the time to look into it, rewire some things to see what needed to be done! A volkswagen is a difficult vehicle to deal with and he was 100% honest with his evaluation and advice! I would go to him and recommend him to anyone! If you are looking for a knowledgable professional that won’t rip you off, look no further !! I can’t say enough about Billy, I have been his customer for about two years, during this period of time he has taken care of not only my vehicles but several of my referals, he has always done an exceptional job in a timely manner, and his prices are far lower than anyone. It is so nice to have a mechanic you can rely on, and refer to friends. Thank you Billy again for another job well done on my vehicle yesterday, you saved me a ton of money, and you fixed my radio on top of the complete over haul on my car, I think your great, and I know other people will too.!!! I was referred to Billy by a dear friend after I noticed a few warning lights suddenly came on. Not only was the problem fixed in one day (he knew I was traveling the next morning) the cost was unbelievably fair!! I FINALLY found a TRUSTFUL AND KNOWLEDGEABLE mechanic. I seriously felt like I had won the lottery. My friend told me he was exactly this way with her and I can’t stop singing his praises to anyone who needs their car worked on. I will NEVER EVER go anywhere else. I’m ecstatic!! After getting an expensive estimate from my usual close by mechanic, I looked up other local garages here and My Mechanic undercut everyone else significantly. I brought my car in the next day and Billy looked over the car again, told me which repairs could wait, and did the work quickly. He was professional and courteous and related that his prices are lower because he marks up his parts and labor less than other shops. He even did some other minor work I asked about for free. He seems to genuinely care about his job and his customers. This guy is the real deal, go to him with total confidence that you are getting good work from an honest mechanic. Billy services my fleet of trucks. Being a service company,when one of my trucks is in the shop, its not on the road making money. Billy does what ever it takes to fix them in one day. More than fair pricing and A1 service. I finally found a wonderful auto repair shop that I trust. Best price I’ve ever seen for an inspection. Friendly, professional, quick. No complaints, a positive experience all around. I took my 2003 neon to see Billy at “My Mechanic” for some very much needed TLC. I am very very happy with the work. He is honest and truly cares about his work and gives it 110%. Go see him, and you will be very happy with the results. I have now found my mechanic and will recommend him everyone. This man…go to this man. Billy is by far the best mechanic experience I’ve ever had. My check engine light had been on forever and I’d taken it to countless places, each telling me a different thing. I’d put hundreds of dollars into it to no avail, and was treated less than respectful. I found Billy on garagefly and will thank my lucky stars till the day I die that I did! He found the problem immediately, charged me exceptionally well, and fixed it faster than I thought was possible. He shook my hand, was polite and professional, and now has a returning customer. If your car needs anything, go to him. If you don’t, I’ll find where your car is, and take it in myself! I found My Mechanic at garagefly.com. Billy was very knowledgeable about my vehicle and friendly; He worked quickly and was very reasonable. I will definitely take my car back to My Mechanic as well as recommend him to anyone needing repairs. I found “Billy” at My Mechanic to be honest, efficient, organized, generous, and best of all skilled! He replaced my A/C Blower motor, front brake rotor/pads, changed the oil. I will be going back, have sent him a new customer, and will refer him every chance I get. I’m one of those guys who has the misfortune of owning a sometimes Very finicky Ford F250 6.0 diesel engine truck. The truck has had all the usual problems associated with this particular engine. Each time something has gone wrong from my injectors, to my EGR going out and replacing it with the EGR delete kit and new Oil cooler, all the way to the most recent problem of my Water pump going out, Billy at “My Mechanic” has lived up to my expectations. He’s able to get the parts I need very fast and fixes it even faster. He seems like he actually cares when I have to bring him the truck to fix. In my opinion hes an awesome Diesel guy and from what I’ve seen just as good a Gas Tech!…I’m bringing him the truck this weekend to get a lift kit installed to keep testing his abilities lol I can’t wait for another good showing from My Mechanic! Mechanic accurately diagnosed malfunction and provided a thorough explanation of defective parts, pointing out their location on the vehicle. This was done in a timely manner; diagnostic codes from the engine computer were included on the invoice as well as a clear definition of parts and labor. Mechanic was courteous and easy to communicate with. I would use this shop again. I was referred to Billy by my brother and we couldn’t have been more pleased. He was very knowledgable, professional, and reasonably priced. I will be using him for any future repairs and 100% recommend him to anyone needing car repairs or service. This is actually the second vehicle I’ve brought to Billy in the past 30 days, both for routine maintenance. After a couple of overpriced and under-informed experiences with other repair shops, Billy’s honesty, straight-forward manner, and very reasonable prices are a breath of fresh air. It’s nice to be able to ask questions of the technician working on your vehicle and feel as though the answer you are receiving is honest and informative. I will absolutely be referring anyone I know who is in need of a reliable mechanic. THANK YOU for what you do, Billy! I have been working with Billy for 2 years where he has worked on 3 of my used vehicles. He has repaired two of them at very reasonable rates. The 3rd vehicle, a 96 Audi couldn’t be diagnosed, whereby he did not charge for Service. I took it to a local European dealer who had similar problems and charged big $. I have recommended relatives who are more than satisfied with service and I have scheduled more work with him. Highly recommend. Hi, Billy is been taking care of all the car that I own, and He is a good mechanic, honest and very reliable, ever since I met Him I don’t go anywhere else. I’m very happy with Him & I definitely recommend Him. Fast, affordable and effective. Will definitely be returning when more work is needed. Hi, my name is Shannon and Joe has been my mechanic for about 8 years now. As a single woman I really appreciate the honesty, the hard work that he provides to making sure I am safe on the road. I would highly recommend Joe Ganje to be your mechanic. He is someone you can count on. Billy has been my family’s mechanic for years, and for good reason. His attention to detail, integrity & honesty, as well as flexibility reflect his passion for his profession. I not only highly recommend “My Mechanic”, I depend on them! I Highly Refer Billy @ His AutoShop(My Mechanic)I have known Billy for 10+years & have had nothing but Good results…He Even went out of His way to come replace a Rack & Pinion on a Honda Accord an hour away from Tucson.& now I drive My 1992 Blazer to Billy as HE is the Only Mechanic I let work on My Family Vehical cause as I said its a 1992 But Billy Keeps it Running like a 2012 & I’VE built a Great Trust in Billy…..I Thk U! Billy was very nice and explained everything he was going to do to the car in order to get it fixed. He was very honest with everything that needed to be done and even let me go to an auto parts store to get the parts for cheaper. I highly recommend him to anyone that has a car and needs anything done to the car, including oil changes. Billy has worked on my family’s vehicles for several years. We’ve always relied on him, and he’s always looked out for us. He won’t sell you what you don’t need. My wife and I have been going to Billy for a couple of years. Billy has always been fair and straight forward with us which is refreshing to have out of a shop in Tucson. Billy recently installed a lift on my Tundra. It was completed on time and we have had no issues at all. I would recommend Billy (My Mechanic) to anyone. Thank for your searching for auto repair service in Phoenix, AZ, and Tucson, AZ, areas. We are pleased you've chosen GarageFly to help you with your automotive repair needs. My Mechanic Maintenance & Repair is one of GarageFly's many user rated and reviewed auto repair shops in the Phoenix, AZ, and Tucson, AZ, areas. There are so many choices for automobile repair in Arizona; we feel it's important for you to be well informed. Please visit http://www.mymechanicarizona.com/ for more information about this automobile repair shop's services.